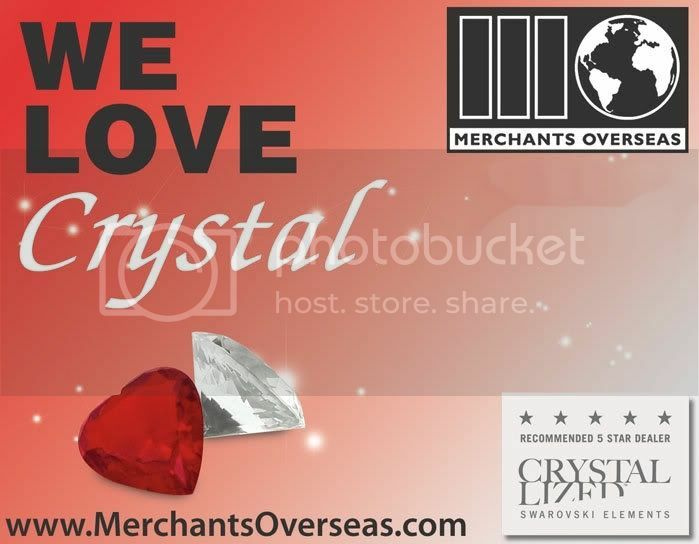 For all of you DIYers out there, if you don’t already know, Merchants Overseas is your One-Stop-Shop for all things crystal. 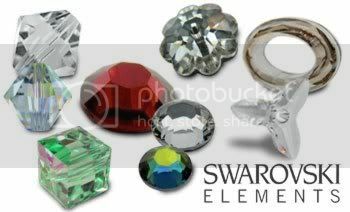 We stock an expansive collection of Swarovski Crystal articles, sizes and colors including: Beads, Flatbacks, Hot-fix, Pendants, Chatons, Fancies, Rhondelles, Sew-ons, Buttons, Cup-chain, Filigrees, Banding, Trimming, Transfer appliqués and much more! This custom Bridal Necklace is a great example of how I used a variety of Swarovski beads and pendants in a variety of shapes and colors! Whether you are a reseller, retailer, or just like to make your own designs, you can get everything you need quick and easy! If you don’t know what all of that means, feel free to post ALL OF YOUR QUESTIONS right on this blog. This is a place we would like to use for discussion, inspiration and as a help desk for all of our new or existing friends. The first 20 people to comment or post on this blog will enter the chance to win this exact Necklace! 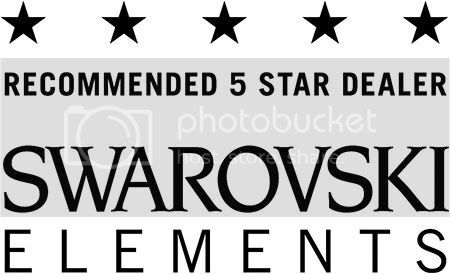 24 Responses to "Do-It-Yourself with CRYSTALLIZED™- Swarovski Elements – Win This Crystal Necklace"
We still need 14 posts before we can pick a winner! Definitely let all of your jewelry-loving friends know! I love this. I have announced this giveaway at http://www.handmade-jewelry-club.com too. HI I WOULD LIKE TO PARTICIPATE IN THE NECKLACE GIVEAWAY,PLEASE. I WANT TO BE ONE OF THE 20 WINNERS, IS A BEAUTIFULL NECKLACE AND A GREAT GIFT FOR ME IN THE HOLIDAYS. THANKS FOR THE OPPORTUNITY AND HAPPY BEADING. this would be great, thanks for the opportunity! What a lovely necklace. What millimeter size is a 34ss flat back? Thank you for the kind compliment and great question! A 34ss flat back is equivalent to 7.069-7.272 millimeters. Keep sending those great questions! Love the clasp – is it magnetic? Thanks Kerstin! Thank you for participating in our give away! Yes, that particular clasp is a Beadelle™ Magnetic Clasp. They come in gold or silver plating and are a great alternative to traditional lobster claw clasps and for those who struggle with them. The Beadelle™ Magnetic Clasp also comes with an extra lobster claw to give you the option of easily attaching one onto a jewelry piece you already own. These clasps are strong and secure, so you don’t have to worry about your necklace or bracelet falling off! My daughter is getting married soon after the first of the year and would love this beautiful necklace. We’ve been looking all over for a design that is not as hard to see from a distance and I do believe this would work wonderfully! I just know she’d love it, and if we actually won this necklace it would save an amazing amount of time and money. Even if I don’t win it I can still make it, as I have a few of the same items in stock already so either way it is great! Hi! I am the daughter who is getting married that Sue P. mentioned. I do love this necklace and Mom has promised to make it for me IF she does not win it. She said she can even make the earrings to match. I am so excited! I hope the other comments are posted soon so you can have the drawing so we’ll know if we are winning or making the necklace. Thanks so much for perfect timing for the perfect item! I love it! This necklace is beautiful! 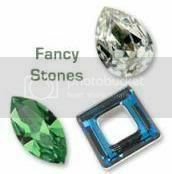 I love the combination of sizes, shapes and colors! Wow!! Beautiful necklace. Elegant and perfect for this holiday season. Can’t wait to find out who the lucky person will be to win this lovely piece. Good luck to all!! What a lovely necklace! It would look beautiful on a bride. Good luck to all out there! I would like to enter the contest. I was wondering what size the necklace was…14-16 inch? Thank you for entering Lorraine! The necklace fits like a choker and is 14 inches. Thanks so much for a contest like this. Hopefully I will win it and can give it as a wedding gift to my sister. Of course she would know I didn’t make it, but maybe I can help Mom make either a bracelet or earrings to match. I love working with crystals, and this necklace is a beautiful example of what can be done with them! My daughter is getting married in October, and this would be a fabulous accessory for her! Thank you for the opportunity to win it! HI Lynda! Thanks for participating in our Crystal Necklace giveaway. It’s taking a while, but we are slowly getting to 20 posts. Only 5 more needed and I can finally pick a winner and mail the necklace out. Tell your friends! I’ve been watching closely, and we are finally at 19! YEAH!!! I just love going back and looking at this necklace, and have even designed a set of earrings to go with it. What a gorgeous necklace. You are truly and artist! did anyone win this beauty yet???? Ok finally I can pick a winner! !…………After picking from a hat………our winner is……………………..Jennifer P!!!! Wow! What a lucky bride!! !